On this date in 1944 in the Mari­a­nas, U.S. carrier aircraft began attacking Jap­a­nese defenses on Saipan, Tinian, and Guam in prep­a­ra­tion for the three-week battle on Sai­pan. On July 9 U.S. Marines declared Sai­pan secured, calling the battle for the island “the decisive battle of the Paci­fic offen­sive.” The Jap­a­nese defeat in the Mari­a­nas ripped a hole in Japan’s Pacif­ic inner defen­sive circle, the so-called “Abso­lute National Defense Zone,” once con­sidered essen­tial by the coun­try’s mili­tary leaders to con­tinue the war and pro­tect the Jap­a­nese Home Islands (Hok­kai­dō, Hon­shū, Kyū­shū, and Shi­ko­ku, com­prising an area the size of California). Gone now were the Jap­a­nese for­ward bases in the Cen­tral Paci­fic, making the Ameri­can sub­marine block­ade of Japan more effec­tive than ever. In the first six months of 1944, U.S. sub­ma­rines sank over 300 enemy freighters. During all of 1944 Japan managed to im­port just 5 mil­lion barrels of oil, although the nation con­sumed over 19 mil­lion barrels. Nineteen forty-four saw the total ton­nage of Jap­a­nese imports shrink to less than half that of 1941. The war guid­ance unit of the War Minis­try at the Imperial General Head­quarters reached three con­clu­sions: First, the empire had no prospect of regaining its previous strength; secondly, strength would gradually decline; and, thirdly, the nation’s leaders should seek an end to the war immediately. Prime Minister Hideki Tōjō and his war cabi­net resigned in disgrace, but his suc­cessor, Gen. Kuni­aki Koiso (July 22, 1944, to April 7, 1945), believed that Japan needed to win a battle against the U.S. in the Philip­pines to gain leverage in any peace nego­ti­a­tions. Koiso’s hopes were crushed in the Battle of Leyte Gulf (Octo­ber 23–26, 1944), which involved nearly 500 ships; it was the most sprawl­ing and spec­tac­ular naval battle in history. When the smoke cleared, the Jap­a­nese had lost most of what remained of their naval and air power. The U.S. went on to take the Philip­pine’s main island of Luzon, which allowed the U.S. to further cut off the sea lanes between the Jap­a­nese Home Islands and the imports the Jap­a­nese econ­omy and war machine desper­ately needed. By the end of 1944, the num­ber of U.S. sub­ma­rines in the Pacific alone stood at 200. Jap­a­nese soldiers in the Philip­pines joked that one could walk from the Philip­pines to Japanese-held Singapore on the tops of U.S. submarine periscopes. 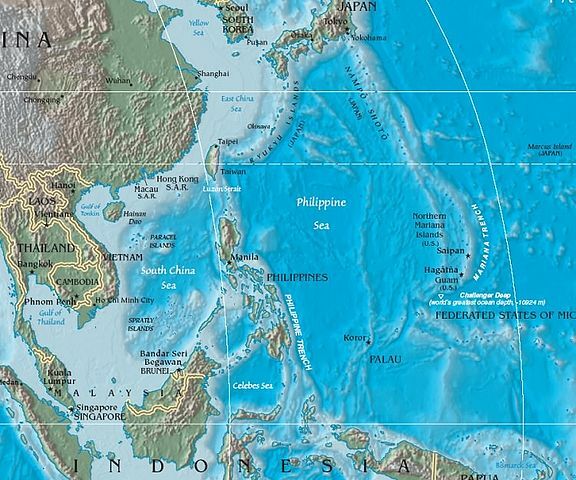 Above: The arc-shaped Mariana archipelago can be seen in the right half of the map in relation to Japan (to the north), New Guinea (to the south), and the Philippine Sea (to the east). Right: Roughly 400–500 Native Americans in the U.S. Marine Corps transmitted tactical messages over military telephone or radio commu­ni­ca­tion nets using formal or informally developed codes built upon their native languages. 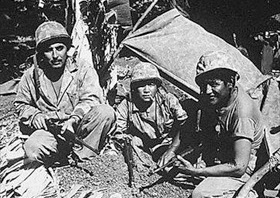 Navajo code talkers were the most famous of the code talkers, but Cherokee, Choctaw, Lakota, Meskwaki, and Comanche code talkers were employed as well. Even speakers of Basque, a European language, were used to encode and decode messages. Left: The U.S. victory on Saipan made nearby Tinian the next logi­cal step in the Mari­anas cam­paign. 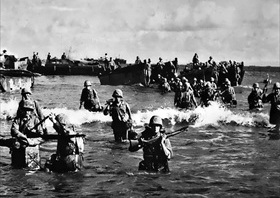 In this photo Marines wade onto Tinian’s beaches. The battle to secure the is­land lasted from July 24 to August 1, 1944. It was from Tinian’s “North Field” that the Enola Gay and Bockscar began their epic missions to bomb Hiroshima and Nagasaki, respectively. 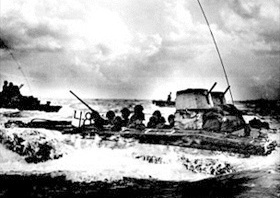 Right: An amphibious landing craft known as a Water Buffalo (aka, Landing Vehicle Tracked [LVT]), loaded with Marines, churns through the sea bound for Tinian’s beaches, July 1944. 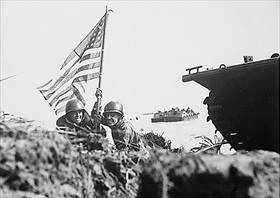 Left: Eight minutes after Marines and Army assault troops landed on Guam, the largest of the Marianas, on July 20, 1944, two GIs planted the American flag. 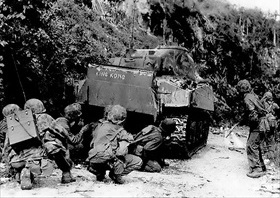 Fighting on Guam ended on August 10, 1944. 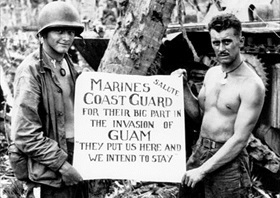 Right: Marines on Guam show their appreciation to the U.S. Coast Guard. During amphib­i­ous landings in the Pacific, Euro­pean, and Medi­ter­ranean theaters, a large per­centage of the landing craft cox­swains were Coast Guard enlisted men, who brought men and supplies ashore and returned with the wounded and dead. Coast Guards­men also manned or partially manned assault transports as well as landed with Marines on Pacific beaches.